Chicago, IL — As a graduate of Morehouse College I have been blessed to witness the black college football experience on multiple occasions. So, it was a pleasure when I was offered tickets from NABJ Chicago to attend the 20th Annual Chicago Football Classic, simply by volunteering to serve on an NABJCC committee. 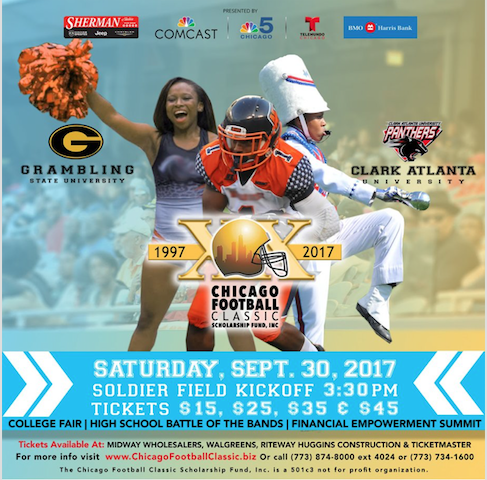 The Sept. 30th event at Soldier Field was a showcase of the best and brightest aspects of the Historically Black College and University experience, featuring the 2016 HBCU National Football Champs — Grambling State University’s Tigers — vs Clark Atlanta University’s Panthers. It gave Chicago an experience of attending an HBCU homecoming. Both schools brought alumni and fans from across the country, as well as, local Chicagoans. Despite the breezy weather, attendees were warmed by the incredible entertainment on and off the field — at the tailgate parties, the game, halftime battle of the bands, and post-game festivities. And the bands from local high schools played with just as much rhythm and passion as their collegiate counterparts! In addition, I had the privilege of seeing Chicago artist Chance the Rapper, who was also in attendance, despite never making an appearance on the field. Overall the event was a massive success, raising critical monies to support low-income students with HBCU scholarships, and I am grateful to NABJ Chicago for the opportunity to experience the beauty of HBCU traditions in Chicago.